If you're in the Philadelphia area, you're going to want to check your calendar off for Saturday, March 22. If you're not in the Philadelphia area, you'll want to start making your travel arrangements now. 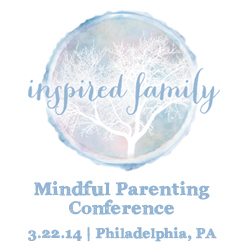 The Inspired Family: A Mindful Parenting Conference, is taking place at Temple University in March 2014. I am delighted and excited to share this conference with you, with an amazing line-up of seminars -- there is truly something for everyone! From pregnancy to toddlerhood, from the individual parent to the family unit, there are sessions covering a wide array of parenting topics.